Okay friends, this may be some of the best bread I've ever made. And not only that, it is definitely the very easiest bread I have ever made, by far. 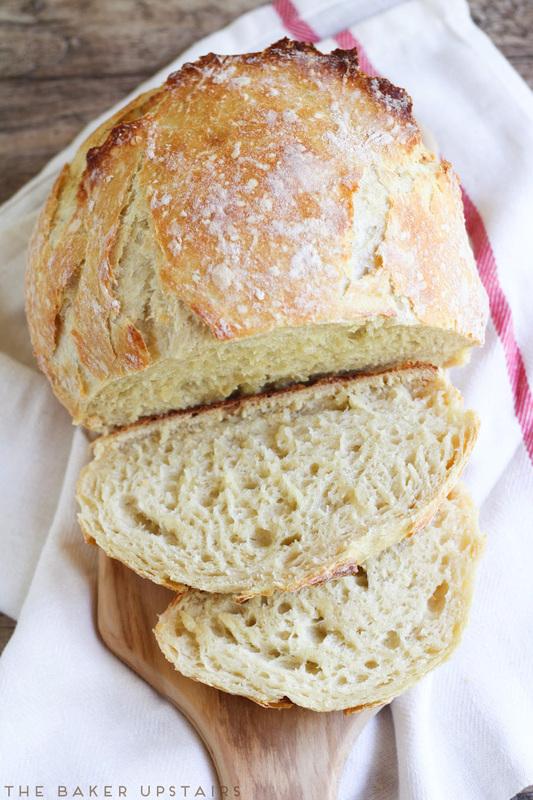 If you're scared to work with yeast, or if you haven't had good results with bread in the past, this is definitely the recipe for you! It literally has maybe 10 minutes tops of active time, and turns out perfectly with basically no effort on your part. I've been really intrigued by dutch oven breads for a while now, and once I finally gave this bread a try, I was shocked that I had waited so long to try something so delicious! It's really as simple as stirring a few basic ingredients together, letting the dough sit for 12-18 hours, then shaping it into a ball and baking it. Easy peasy. 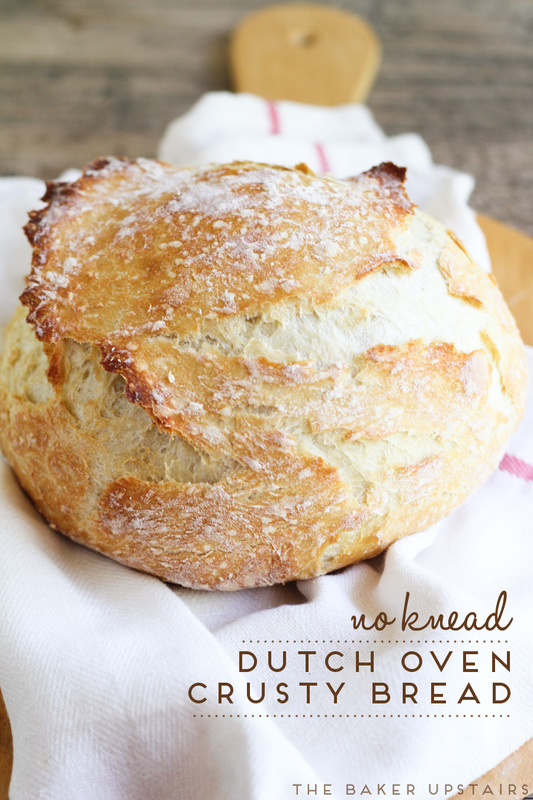 The dutch oven provides the perfect environment for baking and gives the bread the most delicious and perfect crust. The inside of the loaf is soft and moist, and the outside is chewy and crispy, just like what you'd get at a french bakery. I don't think I've ever baked a more beautiful, perfect loaf! This is definitely a must try recipe! In a large bowl, whisk together the flour, salt, and yeast. Add the water and stir until a soft and sticky dough forms. Cover and let rest 12-18 hours. After the dough has rested, preheat the oven to 450 with a dutch oven inside. When the oven has heated, heavily flour your hands and your work surface and shape the dough into a ball. 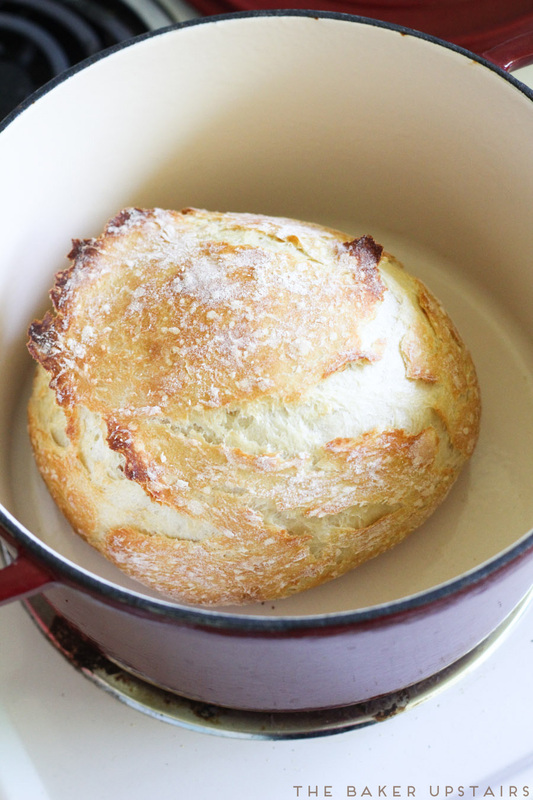 Place the ball of dough into the preheated dutch oven, cover, and return it to the oven. Bake 30 minutes, then remove the lid and bake 15-20 minutes more, or until golden brown. Enjoy! Hi sounds yummy but could you tell me what size D.O. it will need to be I have only a rather small one. Mine is a 5 quart and was a little big for the recipe. I think anything that is 2.5 quarts or larger would work well. Yes. I always use all purpose unless otherwise specified. I'm using gluten free all purpose flour. I'll let you know how it turns out! Is the dough supposed to be fairly thin and loose? It just turns in to a blob at the bottom of my dutch oven. It is baking now, so we shall see how it turns out. Do you grease or oil the inside of the Dutch oven? No, I found that by flouring the ball of dough, it didn't stick to the bottom of the dutch oven. If you're concerned about sticking, you could place the dough on a sheet of parchment paper before you place it in the dutch oven. Rest in room temp or fridge for 12-18 hrs? Do I have to use an enameled cast iron or will my Caphalon work? I haven't tried it, but I assume it would work as long as the pot is well seasoned. Let me know how it turns out! It doesn't matter too much, since the dough rests for such a long time at room temperature. I usually use lukewarm water.